Seemingly endless amounts of water and ideal wind conditions make the Outer Banks one of the best places in the world for kiteboarding and windsurfing! The smooth, shallow waters of the sound and our famous winds attract visitors from as far as Canada and Europe! Consequently, "Canadian Hole" on Hatteras Island earned its moniker. Canadian Hole offers ample room for kiteboarders and windsurfers, as well as a paved parking area and a bath house. You'll also find plenty of excited spectators in awe of the colorful display of kites and sails. Sun Realty's Outer Banks vacation rentals are located near popular kiteboarding and windsurfing spots, and some of our rentals even offer direct sound access for the ultimate convenience. Give us a call at 1-888-853-7770 if you have any questions about a particular vacation home's sound access. Let Sun Realty host your next kiteboarding or windsurfing adventure! Kiteboarding is guaranteed to get your heart pounding no matter your skill level! Experts and beginners can hone their skills in the shallow waters of the Pamlico, Albemarle, and Currituck sounds. While experienced kiteboarders can head east and go extreme in the waves of the Atlantic. Both calm waters and challenging waves are available on the OBX. In many places on the OBX, the ocean and sound are easily within walking distance. 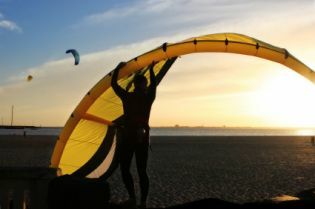 Want to give kiteboarding a try? Hatteras Island is world renowned for being a great place to learn. Miles of flat, shallow water and predictable winds allows beginners to learn quickly with minimal swimming. However, don't try to learn to kiteboard on your own. It's much safer and more efficient to take a lesson from a professional instructor. A beginner lesson will include basics such as rigging, line management, launching, and overall safety. Outer Banks kiteboarding instructors teach vacationers just like you every day. They know how to help you make the most of your kiteboarding experience. Each year, the Outer Banks happily welcomes the annual influx of windsurfers!You can easily spot this group on Highway 12 you'll see vehicles and trailers stacked with equipment and passengers looking for wind and water. Windsurfing is popular in all towns and villages on the Outer Banks, but Hatteras Island reigns supreme when it comes to windsurfing conditions. Windsurfers can find convenient launch points all along the soundside of the Outer Banks. Some of our Hatteras Island vacation rentals even offer private soundfront launch points - talk about convenient! More daring windsurfers can move seaward to test their skills in the waves. Want to give windsurfing a try? Save yourself a huge amount of time - sign up for a windsurfing lesson! This exhilarating sport requires practice and some technical expertise. There are numerous professional windsurfing instructors on the Outer Banks who can safely introduce you to the sport.